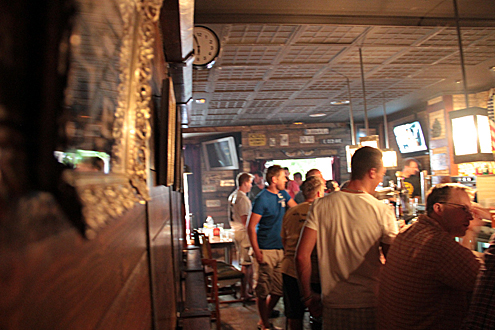 We’ve been watching a bunch of the World Cup games at one of our favorite bars in Valencia — the Portland Ale House. Found on Calle Salamanca near Plaza Canovas, the Portland’s blinking neon arrow provides an unfailing beacon for the thirsty. The Portland is extremely popular among young American and British expats, but also among natives, and there’s a nicely mixed crowd on most nights. Especially popular are the Sunday night pub quizzes, which get underway at 20:00. As far as I’m concerned, there are two overwhelming reasons to show up. First is the sports — American football is shown here (during the season), making it perhaps the only spot in downtown Valencia to get your pigskin fix. Secondly, the Portland has a number of great microbrews. And it’s a place to meet people, especially if you’re an expat who’s missing the homeland a bit. The owner, Mike, is actually from Portland (Oregon) and always happy to chat. Check it out… regardless of where you come from, this is an awesome pub in one of the city’s best corners. Here are two pictures I took at Café Burlón, before and after Spain’s shock loss to Switzerland. Suicide notwithstanding, this was a great place to watch the Spain game. Everyone was clad in jerseys, chanting and screaming. Great atmosphere. Here’s the location. Wear red. Where oh Where Will I Watch the World Cup?! I know. Usually, we try and provide you with information about the city. But this time, I’m stuck. The World Cup begins tomorrow and I have no idea where to watch it! When we lived in Berlin, every bar had huge screen televisions set up outside, on street corners or in makeshift gardens. The city had set up gigantic screens in the public gardens. There were hundreds of awesome places to catch a game, in every neighborhood. But here in Valencia? I’m not sure! I don’t necessarily mind watching the games on a small TV, but preferable would be a BIG screen, with seating outside. Do any of our readers have a suggestion? Update: Las Provincias reports that you can watch some games in 3D at certain cinemas. Now, I have to figure out where the hell either Yelmo Cines, Cinesa or Kinépolis are! Sala El Loco (location) is one of the top concert venues in the city. In addition to music, they feature theater and comedy acts. This Friday night, you can check out the Friki day of pride party, for just a €5 entrance. 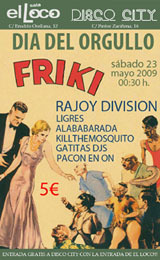 “Friki” is the cute Spanish translation of Freak. Bands like Rajoy Division and Ligres will be performing for what’s sure to be an interesting crowd. If freaks aren’t your thing, still make sure and check out the other events on their funky website. Their concerts and events are pretty eclectic; the emphasis seems to be on “cool”.